Following a funeral or on the anniversary of a passing you may wish to send a caring message to a loved one. 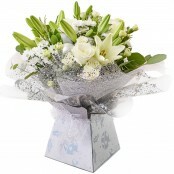 Here is a selection of suitable bouquets and arrangements. Each fitting of a sad occasion and suitable for a quiet personal message. Hand delivered by our florist dame or next day.